What is the “collaborative relationship” and why it is important? What kind of work does an Administrative Consultant do? Do Administrative Consultants do other things besides administrative support? How much does an Administrative Consultant charge? Who works with Administrative Consultants? Where does an Administrative Consultant work? Are Administrative Consultants like employees? Are there certain kinds of work that an Administrative Consultant doesn’t do? How do I know I can trust someone enough to give them access to my personal information and count on them to be reliable and competent enough to assign work? What kind of references or assurances can I ask a candidate for? What can I do to safeguard myself if I do hire someone? I haven’t completely wrapped my brain around how this works. How do I figure out what to delegate? Can an Administrative Consultant help me with marketing, direct mail, telemarketing and those kinds of things? Where do I find a qualified Administrative Consultant? 1. What is an Administrative Consultant? Administrative Consultants are skilled professionals who specialize in the expertise of administrative support and working with clients in ongoing, one-on-one collaborative relationships. They are in business to administratively support the client and his or her business as a whole, not just one task here and there. In this way, they gain a big-picture view and understanding of your business and goals. With this kind of context, they can take loads off your plate and extend critical thinking to complete work in ways that better fit and improve the overall foundation of your business. You can’t get that on transactional, piecemeal basis. Like other professional service providers, Administrative Consultants operate remotely from their own places of business and utilize today’s technology to deliver their services and communicate with clients. Administrative Consultants are first and foremost administrative experts. Some may offer additional, separate specialties that fall under creative and/or technical services. Overall, an Administrative Consultant is the professional you call when you need skilled, ongoing administrative support and expertise and employees are not an option. 2. What is the “collaborative relationship” and why is it important? Administration is not an event. It’s not something that is done once and never needs to be done again. It’s ongoing behind-the-scenes work and activities that must be attended to and accomplished throughout the life of your business in order for it to grow, generate revenue and run smoothly and profitably. It’s the absolutely vital work that keeps your business organized and humming along smartly and efficiently. Strategic administrative support, therefore, must also be delivered on an ongoing, continuous basis. The results you want to achieve won’t be accomplished by working together only sporadically. By working in ongoing collaboration with an Administrative Consultant, you get someone whose knowledge and understanding of you, your goals, how your business works and what’s important to you grows ever increasingly the longer you work together. That’s what administrative support is all about, and what will give you the greatest, most cost-effective value and results. 3. What kind of work does an Administrative Consultant do? Administrative Consultants focus on taking care of some or all of your administrative burdens. They do the administrative work that would normally take your time, energy and attention away from clients, marketing, networking and all the work that makes you money. They give you the space you need to brainstorm and be creative. The great thing about Administrative Consultants is that you are getting a higher caliber of administrative knowledge, expertise and service than you would generally find in a temp, or even an employee in many cases. Our industry surveys of the past five years indicate that the majority of Administrative Consultants have an average of 20 years’ real-world experience and training before going into business for themselves, and most have at least one college degree. The core service and true value of an Administrative Consultant is in the collaborative working relationship itself. Administrative support isn’t about single, project-oriented tasks. It’s about a package of administrative work and management that might include any number of tasks, functions and roles delivered on an ongoing basis. We call this being supported systemically, rather than transactionally. This is how business owners achieve the kind of long-term results and stronger business foundation that working with an Administrative Consultant can bring them. 4. Do Administrative Consultants do other things besides administrative support? A plumber is in the plumbing business. A lawyer is in the legal business. An accountant is in the accounting business. In the same vein, Administrative Consultants are in the administrative support business. That is their specialization, their profession, their craft and category of business. Every Administrative Consultant comes to the table with unique talents and gifts. Many offer additional services that complement their core administrative support services. Just remember, that their profession, expertise and what they are in business to provide, first and foremost, is administrative support. 5. How much does an Administrative Consultant charge? Professional fees will vary from one Administrative Consultant to the next. According to our surveys of the past two years, the current average market range is between $35 - $70 per hour. Keep in mind that an Administrative Consultant’s support is strategic. You won’t be working together on a day-to-day basis or for the same number of hours as a full or even part-time employee. Administrative Consultants typically offer value-added packages of support for which you pay one simple monthly fee. They provide a hugely convenient alternative to employees, and give you access to a higher caliber skill and knowledge level than you might ever be able to afford in an employee. 6. Who works with Administrative Consultants? Their administrative workload isn’t large enough to justify hiring (or dealing with the administration, supervision and legal reporting hassles) of an employee. 7. Where do Administrative Consultants work? From their own offices, of course. That’s one of the reasons their service is so convenient. Because Administrative Consultants are running their own businesses, they also furnish their own equipment, software and tools. Working together virtually is inherently more efficient and cost-effective. Most of your work together won’t require anything more complicated than simply emailing or faxing each other. When necessary, however, there is a huge amount of technology available that makes it a breeze to work together virtually. Administrative Consultants are experts when it comes to this, and will be happy to share more information with you during a consultation. 8. Are Administrative Consultants like employees? No, emphatically. That’s a common misconception among many business owners that we are working hard to dispel. Because Administrative Consultants are independent professionals with other clients to serve, and are not employees, there are going to be differences in how and when you work together and the kinds of things they do for you. An Administrative Consultant is not going to be instantly available to you eight hours a day, five days a week, in the way an employee who works for no one else but you would be. The nature of your relationship is one of professional and client—not employer to employee. Each Administrative Consultant has her own business policies, standards and procedures for working with clients and will inform you of these upon consultation. Remember, an Administrative Consultant is a convenient alternative to employees—not a substitute or replacement for them. 9. Are there certain kinds of work that a Administrative Consultant doesn’t do? Administrative Consultants are not receptionists. Their time is focused on client work and projects, and they have their own phone lines and businesses to take care of. If you have a need in this area and can’t afford an employee, what you need is an answering or call center service, or a live Virtual Receptionist service such as Ruby Receptionists. Administrative Consultants do not run errands. That is the role of an errand or concierge service or personal assistant. You might even hire a local high school student or college intern. Administrative Consultants are not personal assistants. They are administrative experts who focus on providing support to you in your business, not your personal life. However, the administrative work they do for you will free up more of your time to attend to your own personal needs or hire someone who is in the business of doing that. Administrative Consultants are not temps or contract workers. They do not work on-site. They work from their own offices and you hire them for their particular expertise just as you would hire an attorney, bookkeeper, accountant or any other professional. It’s the same kind of relationship. 10. How do I know I can trust someone enough to give them access to my personal information and count on them to be reliable and competent enough to assign work? what kind of references or assurances can I ask a candidate for? what can I do to safeguard myself if I do hire someone? Much of this is going to depend on how you go about your selection process. Each Administrative Consultant is an independent business owner. That means, you need to conduct your research based on a set of qualifying criteria, review websites and then consult with those Administrative Consultants who pique your interest and appear best qualified to meet your needs. None of us ever has any foolproof, 100% guarantee that we won’t have any problems with a service provider we select. As consumers, all any of us can do is try to make the most educated decision possible based on value, quality, competence and personal chemistry. And that requires us to do our homework. Beyond that, there simply will need to be a minimum level of trust extended or there is no basis for the business relationship. Of course, we don’t advise any client to hand over vital, secure personal or business information right off the bat. Remember, administrative support is an ongoing, collaborative relationship. As you continue to work together, you build upon that initial trust. If, at some point in the relationship, it makes sense to give your Administrative Consultant access to that information in order to conduct work on your behalf, that’s something you can decide then. Here is a handy, 7-point checklist to help you make the best, most informed decision: How to Choose an Administrative Consultant. 11. I haven’t completely wrapped my brain around how this works. how do I figure out what to delegate? That’s the beauty of it. When you hire an Administrative Consultant, you are working with a professional, not an employee. 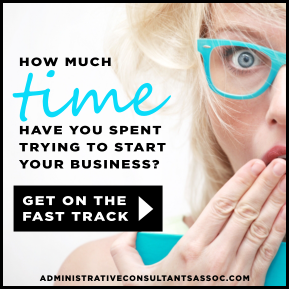 As a business owner, your Administrative Consultants will have her own process for getting things started, helping you determine what to delegate first and coming up with a plan of support. 12. Can an Administrative Consultant help me with marketing, direct mail, telemarketing and those kinds of things? It depends, and really that’s for each individual Administrative Consultant to decide. The most important thing to remember is that Administrative Consultants are administrative experts. If you need marketing consulting, planning and advice, then you should be contacting a marketing expert as that is not the role or expertise of an Administrative Consultant. As far as outsourcing direct mail campaigns, doing mailings, telemarketing, that’s (again) not really what Administrative Consultants are in business to do, although they would definitely help you find a vendor who does provide that service. There are companies who do nothing but that kind of work. That’s all they do, it’s what they specialize in, and they can do those things for you much more quickly, efficiently and affordably than an Administrative Consultant. Likewise, as administrative experts, Administrative Consultants can assist you with the administrative execution and implementation of your marketing actions. Their expertise isn’t in coming up with your marketing plan—that’s a job for a marketing consultant—but they can certainly help you implement and take care of the administrative functions of your marketing plan. For example, your Administrative Consultant doesn’t write your blog posts, but she can take your raw content, proof and edit it, upload it to your blog, schedule posts for publication and make sure it all integrates with your autoresponder, RSS and subscriber list services. Your Administrative Consultant doesn’t write your newsletter, but she can help you create simple templates, establish a publication schedule and upload issues, and set up and manage autoresponder systems and subscription managers. An Administrative Consultant doesn’t write your articles, but she may assist you with submitting them to article marketing sites. She might not do your social networking for you (that needs to be done authentically by you), but she can set up your accounts and help you take advantage of all the various applications and tools that can automate and make those efforts much easier. Plus, with the free time she gives back to you, you’ll have time to do more personal networking yourself. See the distinction? 13. How do I find a qualified, reputable Administrative Consultant? Every Administrative Consultant in our directory is running a committed, legitimate business. No flaky, fly-by-night freelancers who are “here today, gone tomorrow” are ever listed in our directory. Only the most competent, qualified and professional Administrative Consultants who have been pre-screened to meet our high standards of excellence are listed. Only Administrative Consultants are listed. Unlike other directories that include every professional under the sun (which makes your search more difficult and confusing), our directory is only for those who are in the administrative support business. This makes it much quicker and easier for you to peruse listings without overwhelm. We keep our directory neat and tidy--no irritating, time-wasting dead links ever. Your time will not be wasted trying to sort through any mess.